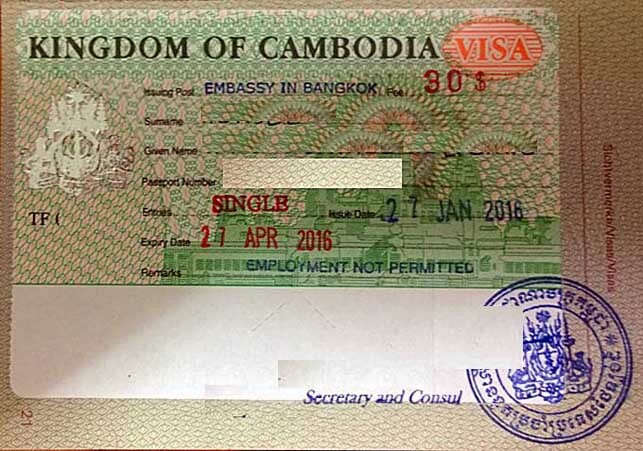 Tired of „Visa on arrival“ queues in Cambodia, bogus e-visa sites and paying „processing fees“? Try old-fashioned visa application instead! – 10:50 leaving house.– Taking bus 27 from Minburi to Latphrao Wangthonglang 17 Baht. – Taxi to Th. Pracha Uthit, Khmer Embassy 55 Baht. – 1200 Baht visa fee. 100 metres stroll to the next copy shop, a copy costs 2 Baht (and that’s actually expensive for Bangkok, near the universities they are 50 Satang each). Back at the visa section of the embassy 11:45. Nobody else in the room any more. – Wide grin. Grinning back even wider. – Wide grin on both sides of the counter. 11:50 returning my passport with pasted visa. Five minutes! The Cambodian Embassy in Thailand is easy to reach between Latphrao and Huai Khwang in Bangkok. Songthaeo (7 Baht) to Th. Siwara (Town-in-Town Hotel), planning to visit my favorite hairdresser nearby. Continuing by bus 36 ก to Th. Ramkhamhaeng (รถเมล์ฟรี, free bus) via Soi 39 Wat Thep Lila. Get off at the bridge to The Mall Bangkapi, Ramkhamhaeng Soi 85/2. Fresh Thai potatoes and pork belly for the Sauerkraut. Across the pedestrian bridge from The Mall first floor to Th. Happy Land Sai 1. It is Sai (line), not „Soi“, by the way. Back home by Bus 27 again: 9 Baht this time. The head of the family is going to cook tomorrow.